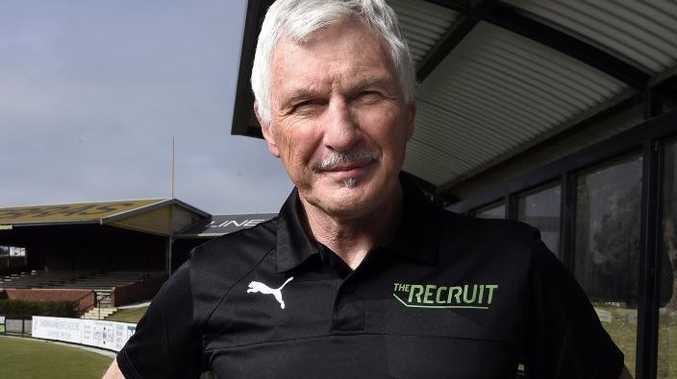 MICK Malthouse is confident he's found a promising footballer in the second season of The Recruit. The former Carlton coach joins Foxtel's AFL talent search as the man 15 weekend warriors will have to impress for a shot at professional glory. "They're lovely kids and they were there because they really had a dream," Malthouse told The Guide. "They've all got a passion for the game and they've all got their own X-factor. "I'm pretty confident that if people (from the AFL clubs) do their research, there's enough to suggest that if they're looking for a certain type of player then he's in this (group of) 15." The 10-part reality series follows 15 amateur athletes (chosen from more than 10000 applicants) who live and play together as a team, while at the same time competing against each other for a guaranteed AFL contract. The first season of The Recruit aired in 2014, and had one of the highest program launches in subscription television history. Despite its success, Malthouse admits he had reservations about signing on to the show. "Initially I was not going to do it, but I was encouraged by my wife and kids. "My family said you've spent your life getting the best out of people and all of these (players) are on their second or third chances. The more I thought about it I realised it is something I do enjoy." The 62-year-old said coaching was the easiest part of the filming process. "I found out that I'm not an actor, I'm not great with lines," he said. "We worked out it was better for me to just be natural. The crew was outstanding and really made me feel at home." Malthouse is joined by the returning coaching team of former Hawthorn champion and Fox Footy commentator Ben Dixon as assistant coach, Port Adelaide's fitness guru Darren Burgess as high performance coach and sports administrator Leigh Russell who, as mind coach, is responsible for the mental strength and well-being of the contestants. In each episode, the recruits will be judged by their performance in individual and team challenges held both on and off the footy field. The player deemed the weakest every week by Malthouse will be eliminated. "This is a 10-week program and there's little room for error," Malthouse said. "For these players it is a matter of adjusting very quickly and showing some promise. "I know there's always a hidden talent somewhere. Nearly all of them surprised me in some way. Some went forward, some sideways and a couple backwards." Season two of The Recruit features guest appearances by Anthony Koutoufides, Jason Akermanis, Brendan Fevola, Barry Hall, boxer Lauryn Eagle and Dermott Brereton. Malthouse said he'd be open to returning for a third season of The Recruit if this year goes well. "If the opportunity arose again and people said it's been successful, then I would for sure." Season two of The Recruit premieres on Wednesday at 8.30pm on Fox8.